Thanks to modern medicine, our population is largely protected through vaccination from the ravages of polio, measles, tetanus, diphtheria, whooping cough, and other contagious afflictions – including cervical cancer spread by HPV. However, Vancouver Coastal, the regional health authority in charge of most things medical, recently reported that childhood immunization rates in most categories tend to be below average on the North Shore. To cite only one example, Grade 9 HPV vaccination rates are 90 per cent in Richmond and only 64 per cent in West Vancouver. Imagine that, avoiding a vaccination which protects you from cancer! Since the North Shore is proud of its public health, advanced education, and sophistication metrics, this is a puzzle. Could it be that the counter-culture of distrust finds a home here? Or perhaps we are simply too busy on other things. Certainly, vaccination has been targeted by certain individuals seeking an explanation for some of the medical puzzles and other frustrations of modern life. It is tempting to seek one’s own answers – frequently on the internet, which offers an unlimited supply of unfiltered information, all the way from Nobel-prize winning science to the downright weird. In our complicated world, we have become reliant on technology, science, and evidence-based knowledge for everything from the composition of a healthy diet, to how to survive a heart attack. And how to build a bridge, provide our homes with clean water, and how to travel safely in a few hours from point A to point B virtually anywhere in the world. It is also clear that the rate of change is accelerating – and with it our reliance on the experts. I have developed my own healthy skepticism of those who peddle quick solutions to complex issues, or who have learned to exploit the understandable urge to shout “Stop the world, I want to get off!” So skepticism can be good – and certainly warranted with respect to much of the stuff one finds on the internet. But until we can all go to UBC Medical School and develop our own expertise, we are stuck with what experienced, licensed, and regulated health practitioners tell us. We should listen to them, rather than believing that Jim Carrey or Google and the internet can prescribe a less medically risky tomorrow. The compact enclave of Pemberton Heights, tucked away from North Vancouver’s hustle and bustle, is – as one real estate firm described it – “definitely one of North Vancouver’s nicest surprises.” Detached homes with carefully trimmed lawns date back to the late 1920’s, tree-lined streets aren’t too busy, and community spirit is strong. Contributing to the feeling of special, is the fact that there are only two or three ways to find your way in! As evidence of community spirit, Pemberton Height’s annual Canada Day bike parade attracts about 100 kids with buggies, bicycles and tricycles adorned with Canadian flags and lots of red and white crepe paper and balloons. I am honoured when organizer Sheena Capozzi, one hand on a loud hailer and the other on daughter Sienna, asks me to undertake the perilous task of judging the bicycles. In truth, almost everybody wins a prize before the fire truck leads the parade down 22nd to Sowden Park. Here, local residents spread picnic blankets, eat hamburgers and watch age-graded bare-foot races for categories ranging from toddler to ultra competitive boomers. The Corner Store is another Pemberton Heights institution, the neighbourhood’s one and only centre of commerce. A reviewer summarizes, “Friendly service, good food and the best drinks. I love sitting on the patio with a book and an iced coffee or Italian ice soda on these hot hot days!” The community rallied behind owner Tracey Cochrane when she presented her case for a liquor license at a DNV public hearing, creating a combination convenience store and restaurant. Tracey prevailed. Capilano United Church, located in the heart of Pemberton Heights, has not fared as well. I am told about one church closes every week across Canada, and the church in Pemberton Heights did not escape this fate. Exactly 100 years after it opened its doors, the BC Conference of the United Church decided to close Capilano United’s doors. 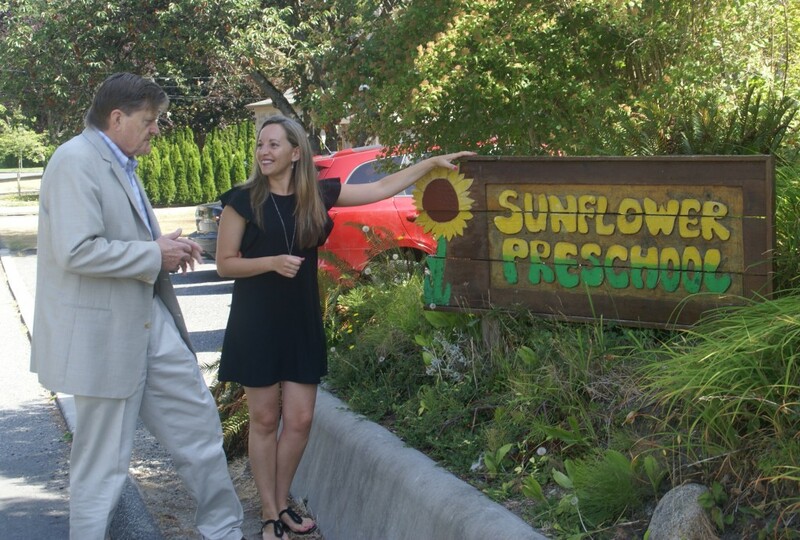 Not only religious services were at stake; so, too, was the Sunflower Early Learning Society and Bonnie Bairns Childcare, looking after about 100 infants, toddlers, and pre-kindergarten children for the busy two-professional families of Pemberton Heights. The daycare and pre-school are housed in purpose built facilities which form part of the church complex. If the church lost its home to redevelopment, so too would the daycare and pre-school. As Sunflower’s web site points out, the Sunflower Society was established more than 35 years ago, and aims to offer a “safe, calm and happy environment where children can grow intellectually, physically and socially.” Ileana Gavrila, Director of the Sunflower Society, and Susan Sherwin, Early Childhood Educator, were strongly influenced by the philosophy of Reggio Emilia of Italy, dating back to the years immediately following World War II. The space which they leased from the Unite Church offered both fenced outdoor playgrounds, classrooms, and nursery quarters. It would be almost impossible to replicate in today’s real estate market on the North Shore. Susan Sherwin came to me, and I added my voice to those many others lobbying NVD Mayor Richard Walton and Councillors, to take action to preserve this institution. Mayor and Councillors agreed. The property has been purchased by the municipality. Further development of the property is being considered; it is apparently feasible to subdivide the property, and recoup much of the purchase price by selling off the front half of the former church property for residential development, while preserving the existing daycare facilities. Pemberton Heights voices also want to preserve the Church gymnasium and meeting rooms as a community hub, focussing on wellness and education. Most importantly, it looks like Sunflower daycare and Bonnie Bairns Childcare will be preserved! I am reminded that MLAs carry heavy responsibilities. Each year, the Insurance Bureau of Canada visits us to inform us of their insurance concerns; this year, earthquakes. A 9.0 earthquake off the west coast of Vancouver Island would leave us with $75 billion of loss with only $20 billion of insurance. They also reminded us that our own Auditor General had recently issued a toughly worded report on Catastrophic Earthquake Preparedness, saying we had not made much progress in getting ready since the last report 17 years ago. We are simply not prepared for earthquakes such as destroyed much of Christchurch, New Zealand in 2011 (magnitude 6.3, 185 people killed). Attorney General Anton accepted the report – no doubt with a gulp – but observed that earthquake preparedness was not simply a government responsibility; we were all in this together. Adding to the cheerful chorus, U.S. Federal agencies estimate a level 9 event will wipeout everything west of I-5. We live in an earthquake zone as evidenced by a recent seriously large but fortunately 6.1 tremor off Haida Gwai. The planet seems “alive,” with significant volcanos erupting in Chile and Indonesia, and lesser ones in Nepal and near Japan. Our corner of British Columbia is itself a very active seismic zone, which is no surprise since the tectonic plate from the Pacific pushes vigorously against the tectonic plate underlying North America, creating our wonderfully craggy coast mountains. Come to think of it, as I type this essay at my desk in the Legislature it occurs to me that I spend much of my life in an architecturally magnificent pile of granite built to the highest 19th century standards and held together by – gravity. MLA’s sometimes wonder about the previous Speaker who ruled no seismic upgrade for us, as long as one school child was at risk. Job one is to prepare one’s own personal Emergency Kit, outfitted under the reasonable assumption that we on the North Shore will be cut off from the rest of the world for – a week or more? – with damaged bridges, no water supply, no food, no electricity, no internet, and no cell phone service. So buy a large red backpack, and fill it with enough to tide you over, plus other vital items such as candles, sleeping bags, and medicines. Don’t forget the toilet paper. Ah .. but I had such a carefully calculated stash already: in a plastic box shoved behind old bicycles and older skis in the back of the laundry room. Undisturbed for a dozen years, the canned sardines are not edible, the flashlights are dead, and the water bottles are empty. Get ready folks. The big one may be just around the corner – and face it, with the nearest Canadian Army base being in Edmonton, we are mostly on our own! North Shore residents face a tough choice; which is it to be? Lawns or salmon? We are cautioned against watering the lawns, washing the car, or – horror of horrors – casually hosing down the driveway. Whatever happened to the Wet Coast? Is it conceivable we are running short of water? I was recently asked to help declare Metro Water District’s $300 million twin tunnel water filtration project completed and ready for business. 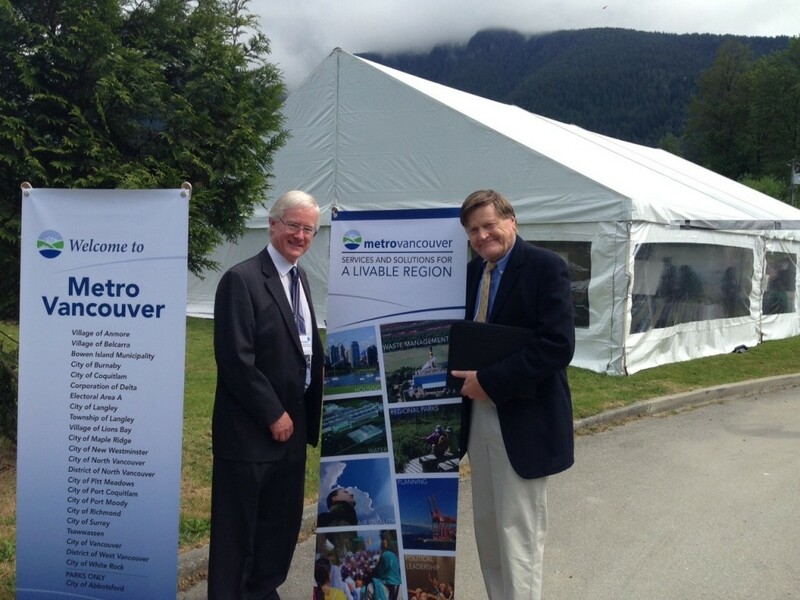 The venue for this photo op was the lawn adjacent to Cleveland Dam with Capilano Lake in the background. Water will be pumped through an underground tunnel system all the way to Seymour, cleansed, and then allowed to flow downhill back to my riding where it will be redirected to the bathtubs and occasional swimming pools of Metro Vancouver. None of the officials – certainly not me – talked about the already visible hints of the reservoir’s receding beachline as we spoke. Truth be told, the sun had weeks earlier melted the snowpack on The Lions, and inflows to Capilano Lake are now minimal. Metro also relies on the Seymour River reservoir and the Coquitlam River reservoir (which competes with BC Hydro for water use). And West Vancouver prudently developed its own Eagle Lake water supply years ago, thereby avoiding some of the large water invoices issued by Metro. But these other sources also face declining water levels. Speaking of paying for it, it seems we on the North Shore are among the minority who actually get metered for water use and charged accordingly. I believe most Metro consumers are on a flat rate: precious little incentive to save water among them! It is time all water usage is metered and paid for accordingly. Or could Canadians’ right to unlimited water at no incremental cost become another Charter issue in court? And speaking further of paying for it, I receive a certain volume of emails finding fault with our government’s timely passage of a new Water Sustainability Act. This will likely mean increased costs for users of surface water, and new fees for ground water users. The prices are hardly crushing, and some believe prices are too low. A municipality consuming 23 billion litres of water will be charged only $25,000. A water bottling operation consuming 200,000 cubic metres of water will be charged $200. The water required to irrigate 40 acres of hay in Kamloops will increase from about $90 to $128. For the very first time, users must pay to use ground water. I have witnessed the unobtrusive Nestlé bottling operation tucked away at one end of Kawkawa Lake where I spent my youth, and many object shrilly to their minimal charge. My response is that the government is to be commended for regulating and licensing water consumption from all sources above or below ground, for the first time, despite objections from agricultural interests. One can no longer sink a large pipe into the ground adjacent to a trout stream and pump away without limit and without charge. We have come to realize that even large aquifers have their limits. As for the modest fees involved; let us first get the principle of user pay firmly established, and argue about the level of prices later. Of this one can be sure: water is becoming scarcer and the days when it was unlimited and free are over.